NIAGARA FALLS, ON--(Marketwire - Nov 1, 2012) - The customer is always right, as the saying goes, so it's no denying that the Niagara Falls Marriott Fallsview Hotel & Spa, which received a Travelocity Excellence Reward, is among the best hotels near Fallsview Casino in Niagara Falls. The Travelocity Excellence Award is an annual award recognizing the very best hotels based on sales/bookings and customer experience on the site. Only the top 500 hotels offered on Travelocity receive a Travelocity Excellence Award, and this luxury hotel in Niagara Falls is one of only three award-winners in Niagara Falls. "We are very proud to receive this recognition," Anthony Annunziata, vice president of marketing for the Niagara Falls Marriott properties, says. "We have worked hard to create a great experience for our guests in terms of comfort, service and amenities, so to be recognized for that is a great accomplishment. It says that when you stay with us at the Marriott Fallsview Hotel & Spa in Niagara Falls, you are staying at a great hotel." A focus on providing visitors with a best-in-class experience, outstanding services and excellent staff has distinguished the Marriott Fallsview Hotel & Spa as one of the best hotels in Canada's tourism capital, according to Travelocity. "We appreciate Travelocity recognizing our commitment of going above and beyond to provide our guests with the best Niagara Falls experience possible," Annunziata says. "We strive to meet the needs of our guests in every way, and it feels great to know that we are accomplishing our goals." 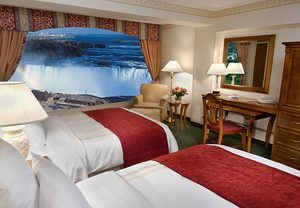 To learn more about the Niagara Falls Marriott Fallsview Hotel & Spa, visit the hotel website at http://www.marriott.com/hotels/travel/iagnf-niagara-falls-marriott-fallsview-hotel-and-spa/, where you can book rooms, browse photos, search deals and packages and get more information about its award-winning Fallsview restaurant. The Niagara Falls Marriott Fallsview Hotel & Spa offers luxury amenities, rooms with views, top service and the prestige of being the closest hotel to Niagara Falls. Just moments from the area's top attractions, including Scotiabank Convention Center and Casino Niagara, this romantic hotel's guestrooms are perfect for a romantic escape. Accommodations feature breathtaking falls views, room service, high-speed wireless Internet, coffee/tea service and plush beds with cotton-rich linens, designer duvets, fluffy pillows and down comforters. Family, two-bedroom, whirlpool, fireplace, loft, junior and presidential suites are all available to create your perfect stay. Onsite amenities at this Ontario hotel were created for relaxation and indulgence and include a fitness center, indoor pool, two whirlpools, sauna, steam room and full-service Serenity Spa By The Falls. In addition to the American and Canadian Horseshoe falls, you can spend your day exploring Maid of the Mist, Clifton Hill Amusement Area and the Butterfly Conservatory. Before or after a full day, grab a coffee and pastry at Starbucks or light fare and cocktails at the Lobby Bar. For award-winning international cuisine, great views and an elegant bar scene, head to Terrapin Grille Fallsview Restaurant. For an extra-special event venue, book your wedding or celebration at this hotel's more than 10,000 sq. ft. of event space, featuring natural lighting and full falls views. Only the top 500 hotels offered on Travelocity receive a Travelocity Excellence Award, and this luxury hotel in Niagara Falls is one of only three award-winners in Niagara Falls.